Hey folks, Matthew Weiss here. I am the recordist and mixer for Akon, and content provider for The Pro Audio Files. I’m well into my second decade as a sound engineer, with many big name credits and a Spelman award under my belt. Now, I found that in 2018, both major label artists and indie grass root bands do some degree of recording at home. Recording studios are designed to facilitate a great sound right at the microphone, which makes the mixing process really straight forward. However, home recordings have some other challenges and obstacles that make the mixing process a little bit more daunting. That’s why I’ve created my tutorial, Mixing Home Recordings. The purpose is to take home recordings and show both how I conceptualize what to do with the sound, and demonstrate the techniques I use to get the results that I want. The tutorial is divided into three segments. The first is a hard rock tune that was recorded in a small rehearsal space using mostly dynamic microphones, and a couple of inexpensive condensers. The second is an indie pop tune that was recorded in maybe not the best manner. There’s a lot of problems with the sound, and so I have to get over those obstacles, and how I do it might surprise you. The third segment is a Hip Hop tune that was recorded on less than a $500 setup, and in addition to that, I do that segment on my laptop using my headphones, to show that the way I conceptualize and approach this translates from the commercial studio to the most inexpensive setups. Sometimes, when we’re mixing, it’s hard to figure out what we’re really trying to hear, and even harder to figure out how to get it that way. Let me show you how it’s done. 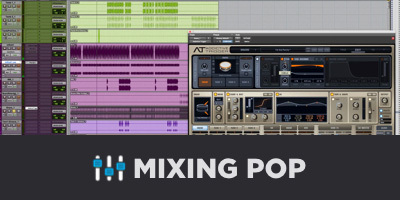 So click on over to mixinghomerecordings.com and get started. Until next time, guys.